Any Canadian outdoor fanatic has likely spent a lot of time at… MEC. MEC is a Canadian retailer and it”™s acronym stands for… Mountain Equipment Co-op. As the name implies, it is a co-op and offers a lifetime membership for $5. It currently has 3.6 million members in Canada. Its roots lie in the 1970s when climbers wanted to be able to purchase local gear. It has come a long way since then and is a household name for most outdoor enthusiasts offering a variety of outdoor gear as well as their own awesome MEC branded products. Whether it is hiking, climbing, biking, traveling or any other activity that requires outdoor “gear,” MEC is my go-to.… I even purchased everything for my household Emergency Kit… from MEC! Their own branded products are always excellent quality and priced below the other products in the same category. I am always on the hunt for great value products and am the proud owner of a MEC 60 L hiking pack,… MEC gators… ( those silly looking waterproof things that you out over your boots and up to your knees to keep the mud out of your shoes), lots of MEC clothing (from hiking gear to travel wear) and now MEC packing cubes. 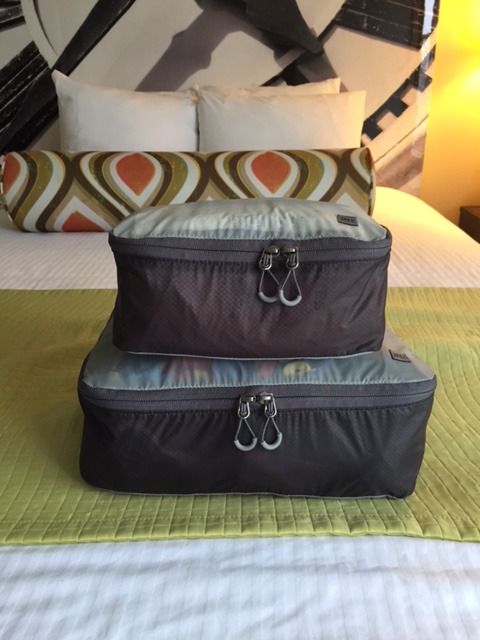 MEC”™s Travel Light Packing Cubes have changed the way I pack. Each person in our family has their own large size cube, and when we arrive at our destination I can dump them into a drawer and don’t need to waste time sorting out who’s stuff is who’s!… The large one measures 26cm x 32cm x 11cm and I find it ideal for our suitcase. 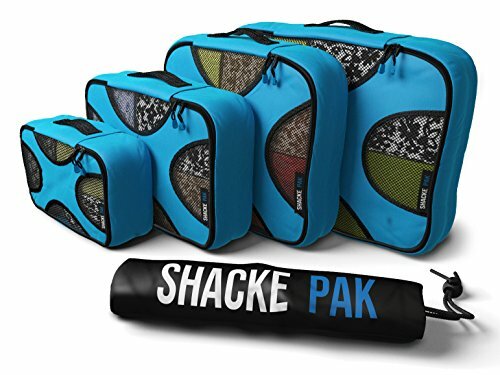 I can fit 4 of them into one case, with room for toiletries and other items packed around them. 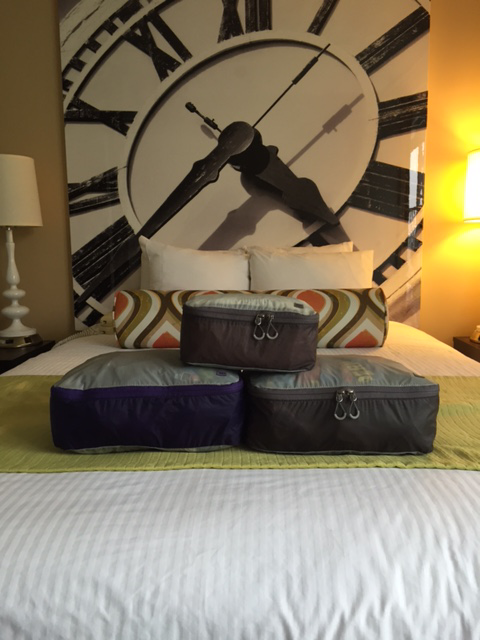 MEC offers… assorted colours… of packing cubes; we currently have black for the guys and purple for the gals (me!). We will be adding light blue to our stock as well, and then we can easier differentiate the kids cubes. 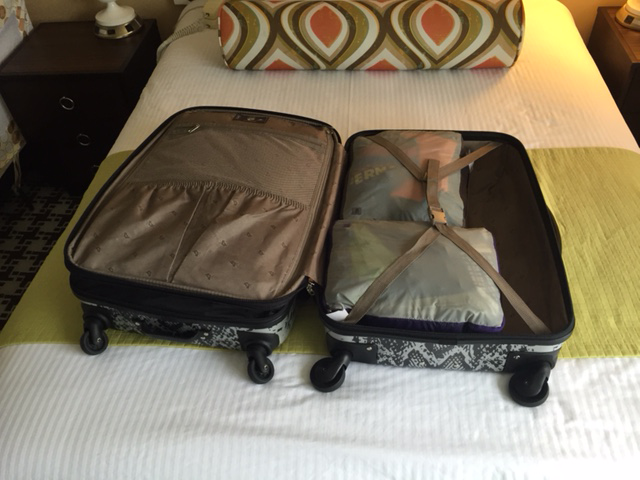 It is amazing how much you can fit into one of these packing cubes! Roll up whatever you can, and fill all of the gaps! The zippers are very strong and I never feel like I am going to tear the bag as I use up every inch of space inside the nylon sack!We can fit a 5 day vacation’s worth of clothes in the boys packing cubes.… Obviously it is a bit different for cold weather travel, as it all takes up more room, but for our upcoming trip to Hawaii, I was able to fit the boy’s clothes in one cube each. 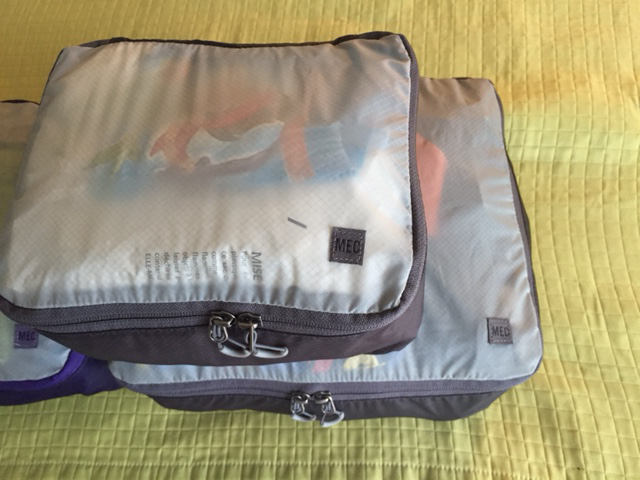 Two Large MEC Packing Cubes fit into one side of my suitcase! 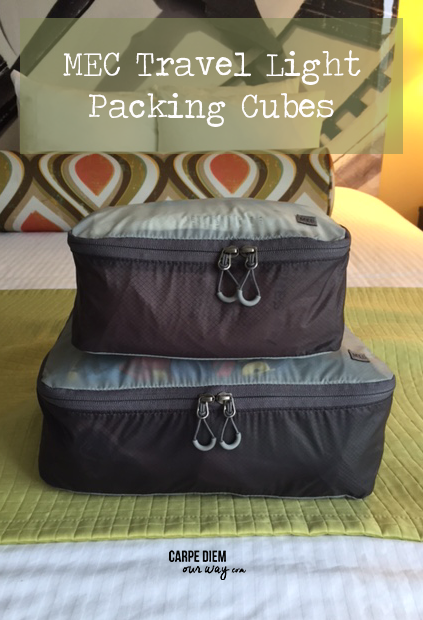 These cubes conveniently fit into my suitcase which enables us to save on baggage fees by just checking one bag!… If you are a real light weight packer, these cubes are… great for your backpack or carry on… as well! ← Welk Resort San Diego for Families a Hit!